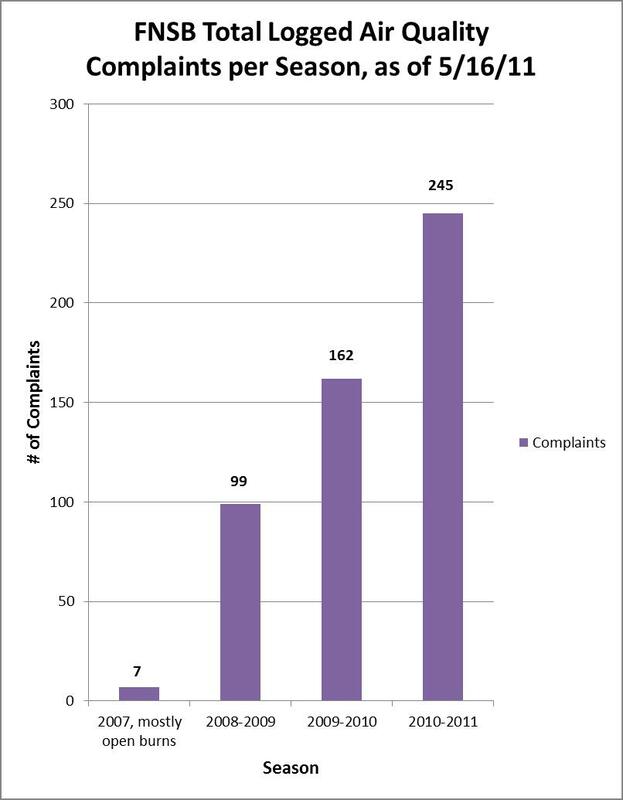 Borough residents have reported over 500 public smoke pollution complaints since 2008. Yet, there is no record that any agency has ever verified a violation, prosecuted an emitter, or issued a fine for smoke pollution in the FNSB. In 2011, the Alaska Department of Environmental Conservation ordered two local emitters to abate smoke nuisances but has been unable to find a violation of either order. DEC can prosecute violations of AS 46.03, AS 46.14, regulations, and orders but has no statutory authority to write tickets for air pollution. 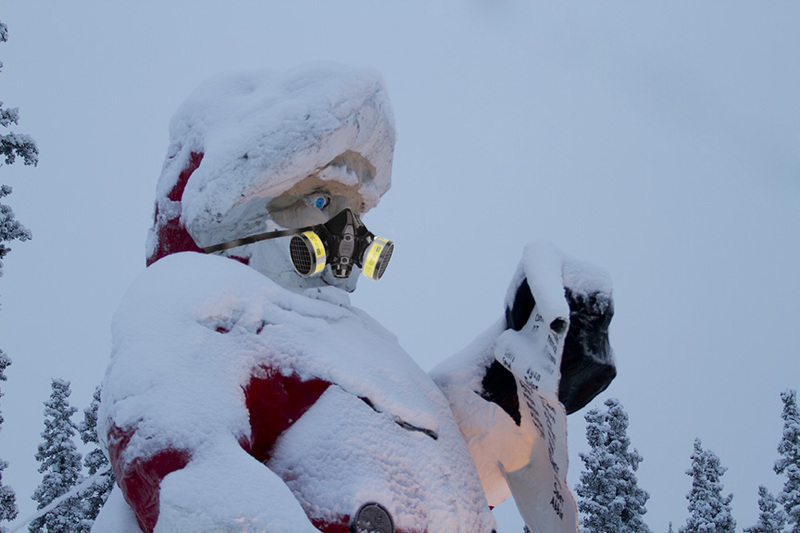 Following are links to laws, regulations, codes, and policies that could help reduce smoke pollution in Fairbanks and North Pole, Alaska. Emphasis added. (b) A person who owns or operates a stationary source that emits an air pollutant subject to this chapter shall ensure that the stationary source complies with this chapter and any other applicable local, state, or federal law. (c) A person may not construct, operate, or modify a stationary source that will result in a violation of the applicable emission standards or that will interfere with the attainment or maintenance of ambient air quality standards. (2) visible emissions that exceed 50 percent opacity for more than 15 minutes in any one hour in an area which an air quality advisory is in effect under 18 AAC 50.245. Visible emissions of exhaust gases from wood-fired heating devices shall be observed at the point of release to the ambient air regardless of the presence of condensed water vapor. All other conditions specified in Method 9 of Appendix A to 40 CFR 60 shall apply. (5) combustibles are not allowed to smolder. (c) Toxic and Acid Gases and Particulate Matter Prohibited. Open burning or incineration of pesticides, halogenated organic compounds, cyanic compounds, or polyurethane products in a way that gives off toxic or acidic gases or particulate matter is prohibited. d) Adverse Effects Prohibited. Open burning of putrescible garbage, animal carcasses, or petroleum-based materials, including materials contaminated with petroleum or petroleum derivatives, is prohibited if it causes odor or black smoke that has an adverse effect on nearby persons or property. (e) Air Quality Advisory. Open burning is prohibited in an area if the department declares an air quality advisory under 18 AAC 50.245, stating that burning is not permitted in that area for that day. This advisory will be based on a determination that there is or is likely to be inadequate air ventilation to maintain the standards set by 18 AAC 50.010. The department will make reasonable efforts to ensure that the advisory is broadcast on local radio or television. State law AS 09.10.070 Actions for torts, for injury to personal property, for certain statutory liabilities, and against peace officers and coroners to be brought in two years. (a) Except as otherwise provided by law, a person may not bring an action (1) for libel, slander, assault, battery, seduction, or false imprisonment, (2) for personal injury or death, or injury to the rights of another not arising on contract and not specifically provided otherwise; (3) for taking, detaining, or injuring personal property, including an action for its specific recovery; (4) upon a statute for a forfeiture or penalty to the state; or (5) upon a liability created by statute, other than a penalty or forfeiture; unless the action is commenced within two years of the accrual of the cause of action. State law AS 44.62.250. Emergency regulations. A regulation or order of repeal may be adopted as an emergency regulation or order of repeal if a state agency makes a written finding, including a statement of the facts that constitute the emergency, that the adoption of the regulation or order of repeal is necessary for the immediate preservation of the public peace, health, safety, or general welfare. The requirements of AS 44.62.040(c), 44.62.060, and 44.62.190 – 44.62.215 do not apply to the initial adoption of emergency regulations; however, upon adoption of an emergency regulation the adopting agency shall immediately submit a copy of it to the lieutenant governor for filing and for publication in the Alaska Administrative Register, and within five days after filing by the lieutenant governor the agency shall give notice of the adoption in accordance with AS 44.62.190(a). Failure to give the required notice by the end of the 10th day automatically repeals the regulation. A person may not pollute or add to the pollution of the air, land, subsurface land, or water of the state. (c) Each day on which a violation described in this section occurs is considered a separate violation. (a) Upon conviction of an offense, a defendant may be sentenced to pay a fine as authorized in this section or as otherwise authorized by law. (2) allows to be placed or deposited upon any premises owned by the person or under the person’s control garbage, offal, dead animals, or any other matter or thing that would be obnoxious or offensive to the public or that would produce, aggravate, or cause the spread of disease or in any way endanger the health of the community. (b) A person who neglects or refuses to abate the nuisance upon order of an officer of the Department of Environmental Conservation is guilty of a misdemeanor and is punishable as provided in AS 46.03.790. In addition to this punishment, the court shall assess damages against the defendant for the expenses of abating the nuisance. (a) When the department finds, after investigation, that a person is causing, engaging in, or maintaining a condition or activity that, in the judgment of its commissioner presents an imminent or present danger to the health or welfare of the people of the state or would result in or be likely to result in irreversible or irreparable damage to the natural resources or environment, and it appears to be prejudicial to the interests of the people of the state to delay action until an opportunity for a hearing can be provided, the department may, without prior hearing, order that person by notice to discontinue, abate, or alleviate the condition or activity. The proscribed condition or activity shall be immediately discontinued, abated, or alleviated. (a) If a municipality or a local air quality district has an approved local air quality control program under AS 46.14.400 and the department determines that the program is being implemented in a manner that fails to meet the terms of the cooperative agreement or is otherwise being inappropriately administered, the department shall give written notice setting out its determination to the municipality or local air quality district. Within 45 days after giving written notice, the department shall conduct a public hearing on the matter. The hearing shall be recorded by any means that ensures an accurate record. As indicated above [see image in MOU], both DEC and the Borough will be responsible for assessing whether or not an air quality complaint received by the respective agency is a violation of either Borough or State regulations. Once it is determined whether or not either, or both, State or Borough regulations are being violated, or have been violated, the appropriate agency will take the lead role in enforcement action. Take the lead in collaboratively developing with DEC a PM 2.5 attainment plan to bring Fairbanks into attainment with the national ambient air quality standard. Prohibited acts and requirements of Chapter 8.21 repealed by Assembly vote following voter approval of Proposition 3 October 2, 2012. Air Pollution Chapter 8.04, the entire open burning section, was repealed by Assembly vote 1/24/2013, citing Prop 3. 3. Provides air pollution control in accordance with AS 46.03, May 14, 1970. D. The commission shall review proposed revisions of regulations or other criteria related to the air quality program and make recommendations to the administration. The commission shall hold public hearings for the purpose of receiving testimony. E. On request of the borough mayor, the commission may fully investigate nuisances, health hazards and other harmful effects related to or caused by air pollution. F. The commission shall develop comprehensive plans for the prevention, abatement, and control of air pollution in the borough. Such plans may include recommendations on subjects including, but not limited to, transportation control measures, zoning, taxation, research, and public relations. G. The commission shall act as a hearing board on appeals on matters relating to the air quality program. The director of the department of environmental services, or such other person as the mayor shall designate, shall perform the duties of the pollution control officer. The officer shall be directly responsible to the borough mayor for the implementation of policies and programs instituted pursuant to law for the control of air and solid waste pollution and disposal within the borough. 3. Authority to inspect equipment, structures, and operations and to make measurements on private property at reasonable hours and with proper notice to the occupant of the premises. B. The officer shall conduct such surveys and research as is necessary to assist the pollution control commission in the drafting of regulations and ordinances. C. The officer shall to the extent practicable encourage the voluntary cooperation by persons and affected groups to achieve the purposes specified above, or regulations pursuant thereto. D. The officer has the authority to issue citations to alleged violators of sections of this code relating to control of air and solid waste pollution and disposal, requiring the alleged violators to appear in a court of law. E. All zoning changes within the borough shall be brought to the attention of the officer by the borough planning director prior to the time notice is given for any public planning commission hearing. If the officer feels that the proposed zoning change will affect the air quality of the borough, he shall issue a report to the planning commission and pollution control commission. The report may recommend approval, modification or disapproval of the proposed zoning change in the interest of maintaining or enhancing the air quality of the borough. F. The officer shall seek voluntary cooperation of citizens, but has the authority to secure judicial search warrants for conducting routine or area inspection with regard to air pollution of any particular place, dwelling, structure, premises, or vehicle. No hydronic heater may be installed inside the City of Fairbanks after June 8, 2009, without a permit issued by the City of Fairbanks. No permit shall be issued until standards are adopted by the Fairbanks City Council. When the city engineer shall find facilities for disposal of sewage, wastewater or other liquids, or waste gases on premises within the city which do not comply with section 10-136, adoption of the Uniform Plumbing Code, or a failure to use facilities that contaminate or pollute or tend to contaminate or pollute the air, a flowing stream, a standing body of water, groundwater, or the ground to such an extent as to endanger human life or health, a report of such findings shall be made for the files of the state department of environmental conservation and copies of said report shall be distributed to the mayor. 8.04.070 Soot, cinders, noxious acids, fumes and gases. A. In addition to the enforcement processes and penalties provided, any condition caused or permitted to exist in violation of any of the provisions of this Ordinance is a threat to public health, safety, and welfare, and is declared and deemed a nuisance, and may be summarily abated or restored at the violator’s expense, and/or a civil action to abate may be taken to enjoin or otherwise compel the cessation of such nuisance. B. It is the duty of the mayor or his designee receiving information or obtaining knowledge of the existence of anything or things declared to be nuisances in this chapter to notify the person committing, creating, keeping or maintaining the same to remove or cause the same to be removed within twenty-four hours, or such other reasonable times may be determined by the city official after such notice has been duly given; and if the same is not removed by such person within the time prescribed in the notice, it shall be the duty of the mayor or his designee to remove or cause to be removed such nuisance or nuisances and all costs and expenses of such removal shall be paid by the persons committing, creating, keeping or maintaining such nuisance or nuisances. A person violating the provisions of this chapter may be punished by a fine of not more than $200 (two hundred dollars) per violation in addition to any costs and expenses for removal of the nuisance. 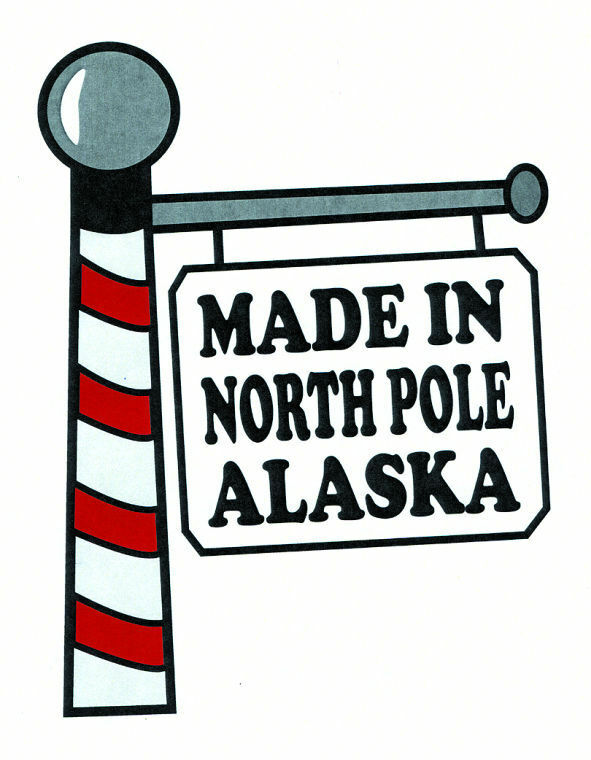 Candidates have put their names in the ring for races in the Borough, City of Fairbanks, and City of North Pole election to be held October 4, 2011. All registered voters in the borough are eligible to vote in borough elections for candidates and the FNSB ballot propositions. The FDNM published this article Candidate filings for local offices sees busy last day 8/15/2011.